It’s a stunning new Mountain Buggy everybody! With a definite artsy, mysterious bent the new release Swift, Night in the Menagerie, features beautiful illustrations of creatures living in a fantastical world. Mountain Buggy wasn’t content with just another patterned fabric release. It wanted a narrative to captivate children and parents alike as they stroll and so the idea was born to feature a poem on the inside of the viewing flap as well as to include a book to treasure. This sure is taking the pram experience to a whole new level! The Swift has fast become a stalwart of the Mountain Buggy family since we featured it first in September 2008. We love to see it getting a limited edition facelift akin to the Urban Baroque which was so popular. There are three colours of the Night in the Menagerie print to choose from – Eclipse, Midnight and Dusk. You can view and pre-order all three at Minimee’s VIP night this Thursday (21 October) from 6pm to 8pm at the Crows Nest Store in Sydney. Great deals can be had on the night – see the Minimee website for more details and to RSVP. If you’re not in Sydney you can still pre-order online for a mid-November delivery for $778.95. 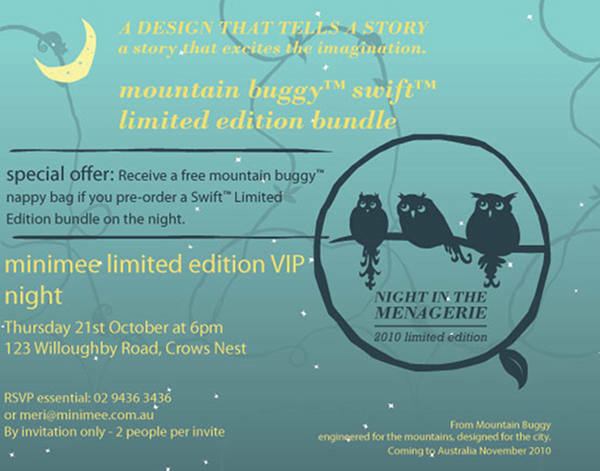 You get a free Mountain Buggy nappy bag for pre-ordering! 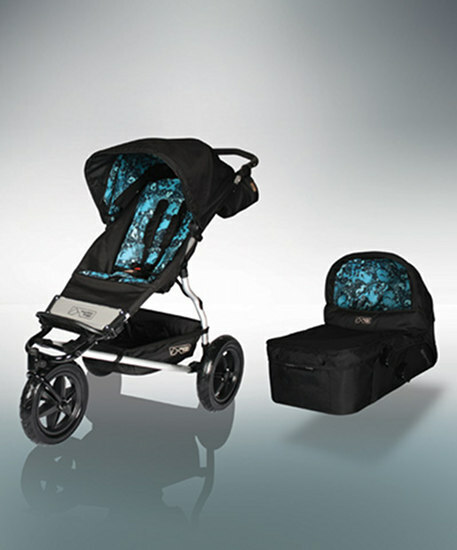 Be sure to compare this pram with others using our Chooser.